For many, this question illustrates the full extent of what they think they know about chiropractic. It reminds us that there are still a lot of misconceptions about what chiropractic is and what’s actually happening during a chiropractic adjustment. Let us clear up a few misconceptions about the chiropractic adjustment. Your nervous system is the control center of your body and it’s not without its weaknesses. Nerves and nerve bundles don’t function well under pressure. So, when your nerves are experiencing any type of interference, they generally let you know it. Interference can come in the form of something like inflammation or a bulging disc that interferes with proper communication between your nerves. A stuck joint can physically press on the nerve or cause inflammation that presses on the nerve. If bones or ligaments are moving the wrong way, they can rub against the nerve. 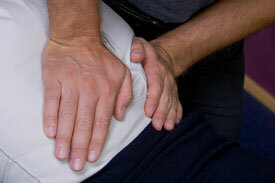 Adjustment of the joint can cause release of this pressure and correct a joint’s position or motion. Adjustments also provide improved nutrient supply to joints. Cartilage and other structures have no blood supply of their own from which to draw nutrients. Instead, they rely on the synovial fluid that circulates around the joints to help deliver the necessary nutrients and remove unwanted waste. If flow of that vital fluid is blocked, the joints can’t get the nutrients they need and can’t eliminate harmful waste products. Why Do I Need Chiropractic? If a joint becomes locked down for a prolonged period of time by a muscle spasm, scar tissue, waste buildup or any other means, the joint will begin to feel stiff and the surrounding joints will begin to compensate for it. Joints are particularly vulnerable to this problem because they work in tandem or as a team. When a joint becomes irritated, it will lock down to prevent further injury and the other members of the team step in to help ease the load. When this happens, you might feel the desire to stretch your arms and legs or to crack your back. You might even feel temporary relief. What’s really happening, though, is the surrounding joints are taking on the added stress and the injured joint continues to be locked down. This is where chiropractic comes in. A chiropractic adjustment can release a full range of motion and create fluid movement. Surrounding joints can return to their proper function. With routine chiropractic care, you can keep your joints moving well, maintain proper posture and function as well as prevent joints from locking down. To learn more about how chiropractic keeps you moving and feeling your best, call our office today!